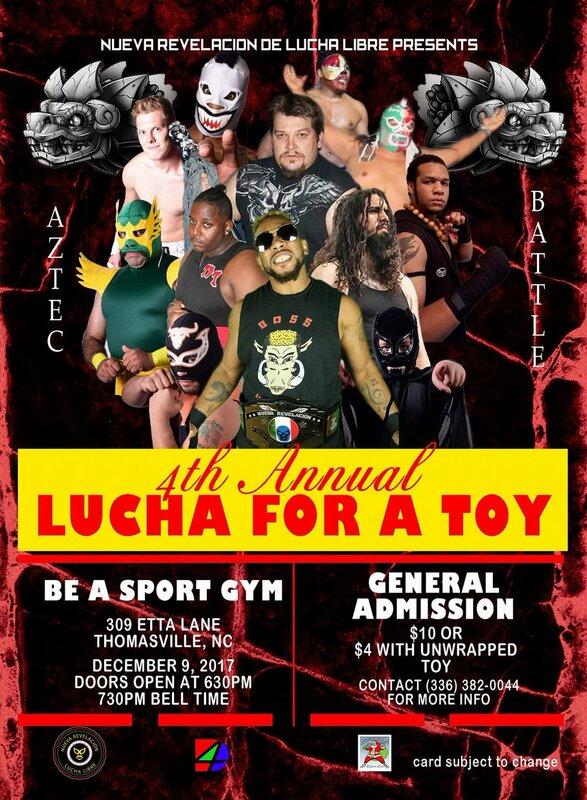 Nueva Revelacion de Lucha Libre returns to Be A Sport Gym, 320 Etta Lane, Thomasville, NC on December 16 (rescheduled date due to snow) as Nueva Revelacion de Lucha Libre's presents the fourth annual Lucha 4 a Toy show. The Aztec Battle is set, Dredd will start of vs Pryme in a one on one match that will then have another competitor enter after the first 2 minutes. Every 20 seconds later, another competitor will enter the #AztecBattle till the locker room is empty. The last 2 competitors will have to finish the match via pin fall or submission. The winner of the match will earn a NRLL Championship match at any time and or place of their choice. Former NRLL Champion Mike Mars is schedule to be at #Lucha4aToy and is furious that #GREATNESS member Deget Bundlez lost the NRLL Championship to the current Champion #BossHogg in a last minute match decision by the #LuchasCordinator Ese Joker. Bring a new unwrapped toy as we will donate the toys to those in need.